In February, (though this year is Feb. 28 – March 5), Germans gather in their town centers and the beer flows freely for a holiday which many Americans may find peculiar. 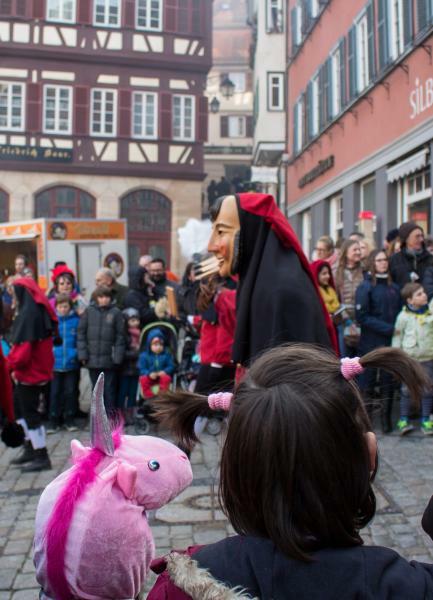 Imagine taking Halloween and Carnival and mashing them together, and you have the sometimes-spooky, sometimes-silly, always-exhilarating German Fasching. 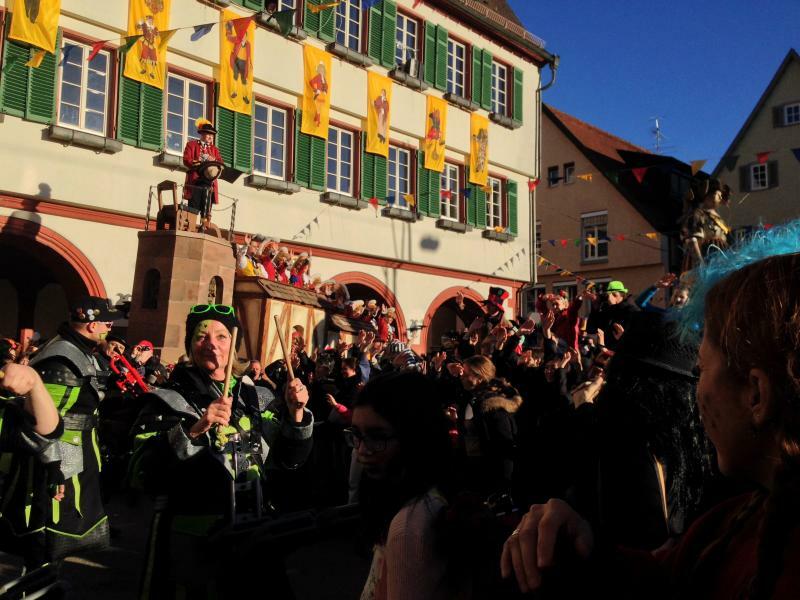 The true singularity of Fasching is the crowd participation, and it’s not always voluntary. People in carved masks, like woodland spirits, slink up to the revelers lining the parade route, and will steal shoelaces, pull hats off, sometimes even pick a person up, put them in a large wheelbarrow and run down the street with their kidnapped prisoner! Children cheer for candy from participants on the floats, and adults who catch the attention of the processioners are given shots of liquor. One man at the Weil der Stadt Fasching Parade (the biggest in Stuttgart) stood solemnly dressed as a monk, holding his Holy Bible for everyone to see. Then, with a wink, he opened the cover to reveal a bottle of Jägermeister as the true content inside. Leave your ego at home when attending Fasching, because practical jokes are a part of the fun. Get in the spirit and grab a beer (or two) and shout for candy along with the kids. Look up local Faschings in your area, or travel to some big names like Weil der Stadt outside of Stuttgart (40 minutes by train from the Hauptbahnhof), or Tübingen, to Stuttgart’s south-west. Tübingen can be reached by bus or train from Stuttgart; parking is limited so public transportation is recommended. Bring cash. Credit and debit cards are mostly useless in these celebrations, so make sure to have some euro in your pockets for food, drinks, and train tickets. Wear layers. February is a funny time in Germany--the days are becoming perceptively longer, and the sun enjoys making its appearance. But the temperatures can be erratic, with one day in the 60s and next in the 30s! There’s nothing worse than being outside shivering or sweating, so dress appropriately and don’t spend your time in misery. Don’t get too drunk. The Germans enjoy their beer, but it’s easy to go from a little tipsy to over the top. Remember that there will be children and families at this event, and nobody wants to watch full-scale debauchery in their hometowns. Always be respectful of local attitudes. Be prepared to deal with heavy traffic. This includes the trains. People will be coming into the city from all around, and it will be congested. Take a deep breath and practice being Zen, as nothing ruins a good Fasching faster than a rotten mood.